In an effort to give its car lineup a more youthful image, Opel (named after the company's founder, Adam Opel) started working on the GT in the early 1960s. Opel reaped the fruit of its labor in 1965 at the Frankfurt Auto Show with a concept car called the Experimental GT. The production GT, which bowed in 1968, took some styling cues from the 1965 concept and blended them with bits and pieces from the Opel Kadett parts bin. The aerodynamic body was built at Brissonneau and Lotz in France and has been accused of too closely resembling the Corvette Sting Ray of the same era. This forty year old debate is best left untouched as it is mostly subjective. Contributing to the GT's sleek style are its pivoting headlights. Rumor has it these headlights were part of the design to meet US Department of Transportation regulations: with them the GT can wear a low, aerodynamic hood but still meet the height regulations for headlights. They turn on via a big lever located on the center console which requires a notoriously large amount of effort to activate. In Europe the base GT was powered by a meager 1078cc four cylinder, though buyers could opt for the Opel Rekord's 1897cc. Deemed too anemic few 1078cc GTs found homes and Opel phased out the engine in 1970. To fill the bottom-level gap the 1078cc left in the GT lineup Opel offered the GT/J, a variant powered by the same 1897cc but with less standard equipment, thus cheaper. The engine transmitted power to the rear wheels through either a four speed manual or a three speed automatic. Vacuum-assisted front disc brakes and rear drum brakes offered effective braking without requiring the driver to put all his weight on the pedal. The GT sold fairly well because it was a lot of car for little money: about $3,500 in Vietnam War-era dollars. For weight distribution reasons the engine was located behind of the front wheels. Marry that to a responsive, non-assisted steering and you get a nimble little car with a point-it-where-you-want-to-go handling. The GT's aerodynamic body was designed in a wind tunnel, something not common in the 1960s, and could boast a top speed of approximately 115 miles per hour. To put this in perspective, a 1969 Mustang with a 351 V8 maxes out at about 119 miles per hour with almost three times the engine displacement. "A lot of car" stops with the driver since the GT has two seats and no trunk to speak of. That isn't an exaggeration for how small the trunk is, it literally has no opening trunk. Instead it has a tiny area behind the seats where the driver and passenger can attempt to store their groceries. Overall the GT proved to be a bargain if one was looking for a fun, affordable personal car. If someone wanted a fun, affordable car to enjoy with their kids, the GT didn't fit the bill. 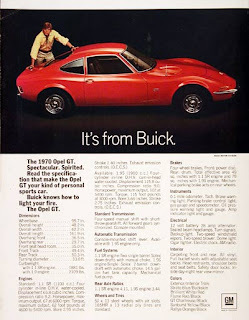 Approximately 70% of the 103,463 GTs built took a ferry to the US where they were sold through Buick dealers. The example below was photographed in a Salt Lake City junkyard. As a side note, have a look at our Facebook page to find photos that aren't in these pages or to discuss some of the cars we feature on this site. Several readers correctly identified the mystery car: it's a Peugeot 504 coupe. 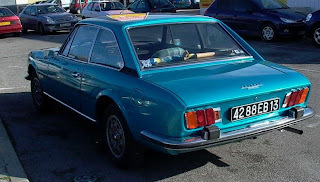 The Peugeot 504 sedan was introduced in 1968 to replace the aging 404 sedan, though the 404 had such a loyal following that production carried on until 1975. The 504 was all-new but not shocking; it was the logical evolution of the 404. It had a modern, austere body and kept the same rear-wheel drive layout as the 404 but a four-wheel independent suspension system improved its handling. 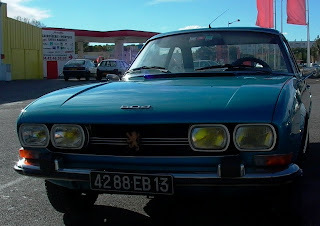 The next year Peugeot introduced a coupe and a convertible version of the 504, both equipped with a 1796cc four-cylinder. 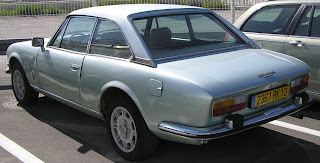 The designed was penned by Pininfarina and differed from the stark 504 sedan. The Pininfarina dress gave the coupe and convertible an elegant, sporty look that was an instant hit in the European automobile press. With the notable exception of rust-proofing the built quality was above par; the 504 continued the 404's tradition of reliability and the entire line stood in a different league than other more haphazardly built cars of the era. All of this came at a price: in 1976 a 504 V6 coupe cost 55,900 francs. To put it in perspective, that same year a base-model 504 sedan cost 28,350 francs and the flagship 604 sedan 47,500 francs, making the 504 coupe the most expensive Peugeot of the 1970s. The 504 coupe's biggest drawback was its lack of performance: initially only the 1795cc straight-four was available, mated to either a four-speed manual or a three-speed automatic. The advantage of this engine was its impressive fuel economy but it made the 504 more of a touring car to drive at a leisurely pace than sports car like an Alfa Romeo 2000 GTV (which, for the record, cost a little less than a Peugeot 504 coupe.) In 1971 the 1796cc grew to 1971cc (104hp) and like the 1796cc could be ordered with fuel injection. The bigger engine paired with a mechanical Kugelfischer fuel injection helped remedy the performance issue a little but not enough to cater to customer demands. 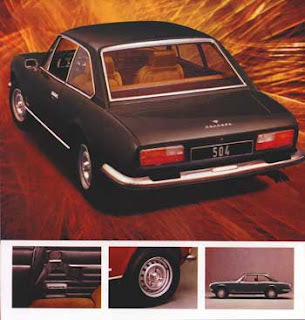 Tired of losing sales to German and Italian competition Peugeot fought back in 1974. 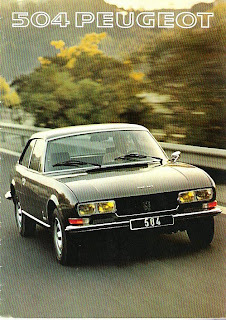 They stuffed their 2664cc PRV (Peugeot Renault Volvo) V6 engine in the 504 coupe and created the antithesis to the four-banger: with 136 hp under the hood the 504 V6 coupe was fairly quick but because of its prodigious fuel consumption the economy aspect was lost. In conjuction with the availability of the PRV engine Peugeot slightly redesigned the coupe's headlights, grille and taillights. Throughout the 1970s Peugeot successfully fielded both four and six-cylinder 504 coupes (and sedans, for that matter) in rallyes across Africa, including the Sahara Rally which the car won in 1978. This solidified the car's reliability reputation. In 1979 the 504 coupe got its third facelift and saw its metal bumpers replaced with plastic body-colored units. 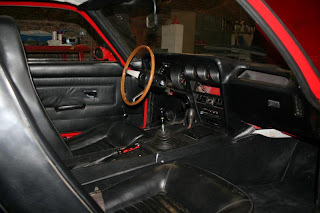 That same year a five-speed manual gearbox was finally available on the four-cylinder engines. The quiet but comfortable production run of the coupe ended in 1983 after 22,975 of them left Peugeot's assembly lines. 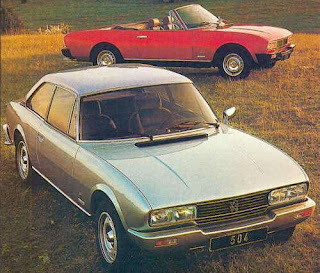 The 505 sedan carried on the 504 sedan's torch but the 504 coupe saw its light burn out when Peugeot opted to not produce a 505 coupe. I photographed this car in a junkyard near Robion, France. If you know what it is shoot us an email at ranwhenparked -at- hotmail -dot- com. We will put up the answer in a few days. Providing information about upcoming cars is not what we focus on at Ran When Parked but we make an exception when the car in question is one we are likely to write about in twenty years from a collector's point of view. 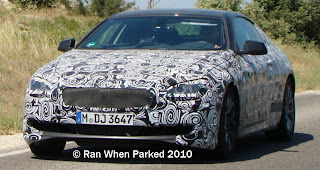 Under the camouflage hides what U.S. BMW CEO Jim O'Donnell calls the "best-looking BMW in years": the 2012 BMW 6-series, code-named the F12 for the coupe (above) and the F13 for the convertible (below). As has always been the case with the 6-series the new model will be based on the 5-series sedan, this time the new F10 model, and will share both its gas and diesel engines. BMW has hinted that the new 6's interior will be roomier than the current car and a less controversial exterior design is expected. Race Oddity: Lotus 56 "turbine car"
Turbine powered automobiles have been tried and tested many times as a replacement to the conventional piston engine. Essentially a jet-engine mated to a mechanical drive shaft, turbines allow a vast power curve and relative simplicity. The idea became gained popularity in the late 1950's "Jet Age" and was experimented with heavily by Chrysler in particular. They proved rather impractical on street cars though for various reasons like extreme heat, noise, and high fuel consumption. Even Rover took the technology to LeMans in 1963 with Graham Hill and Richie Ginther, but that of course is another story. 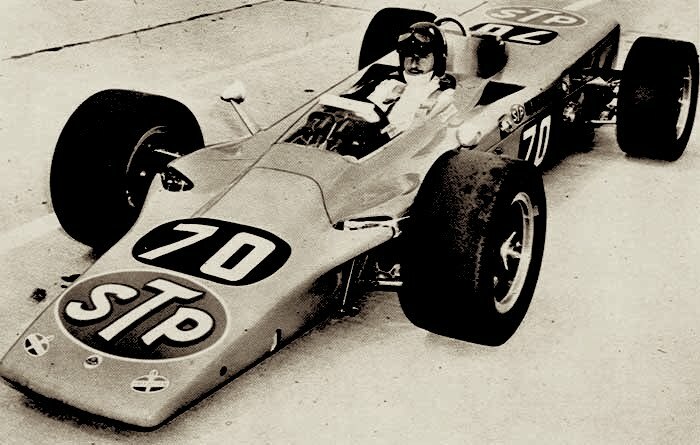 Andy Granatelli's STP-Paxton turbine-powered special came close to winning the 1967 "500" at the hands of Parnelli Jones before dropping out 10 laps from the finish due to a bearing failure in it's unique 1-speed drivetrain. The turbine's wide operating speed range meant changing ratios was unnecessary, but power was sent to the ground with a bespoke Ferguson (as in Massy-Ferguson tractors) four-wheel-drive system. 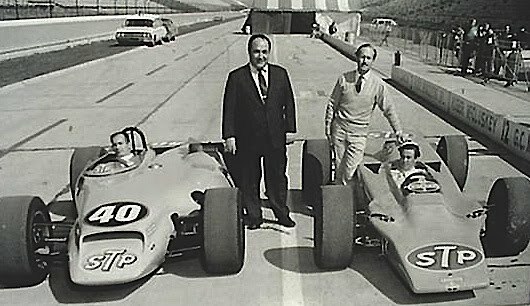 Though it didn't win, Granatelli was sold on the potential of the formula. 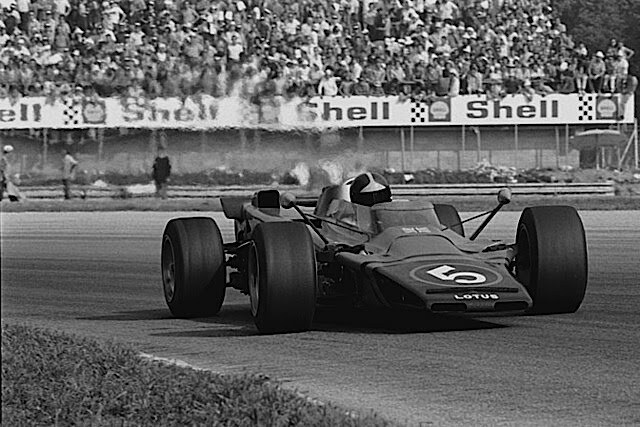 The next year, Lotus joined STP's efforts with their vast racing expertise and built on Granatelli's idea. 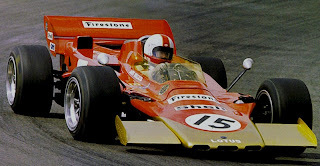 This project became known as the Lotus 56. As if the 500+ horsepower Pratt & Whitney turbine (designed for helicopters) wasn't radical or innovative enough, designer Maurice Philippe clothed the car in an unusual new aerodynamic "wedge" shape. 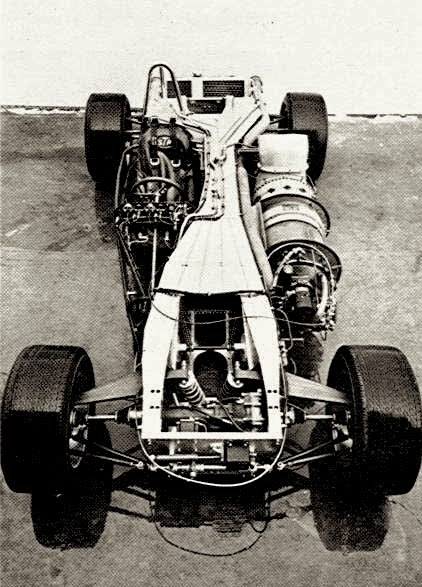 Unlike the 56's predecessor, which placed the driver beside the engine, the Lotus had its turbine was mounted in the center behind the driver, which allowed for a completely symmetrical and balanced chassis. Perhaps even early in development, Lotus had plans for the four-wheel-drive car on tracks that were not just ovals. In any case, it seemed like a very promising package and STP's Granatelli was eager for his team to have a victory at Indy. Initially, Chapman intended to have his best F1 drivers and Indy veterans drive the new machine - Jim Clark and turbine veteran Graham Hill. Tragically, Clark was killed early in 1968 in a Formula 2 crash before the Indianapolis event. Chapman then asked Mike Spence to step in, though he too died at the wheel. During practice for the "500" he struck the wall in one of the 56s and was hit in the head with the right front tire. Former motorcycle racer Joe Leonard replaced him and went on to capture the pole, his teammate Hill qualified in second, and relative newcomer Art Pollard took 11th in a third car. When race day came, Hill's car was the first to bow out, losing a wheel at lap 110 and crashing into Turn 2. Leonard was passed after 31 laps of the race, however, he regained 1st after leader Bobby Unser had problems with his car's transmission. At a re-start after the final caution flag, both Lotus 56s suffered from snapped fuel pump shafts and were forced out of the running. Victory once again eluded the STP turbine-car effort in spite of so much promise. To make matters worse, USAC (Indy's governing organization at the time) banned turbine-power as well as four-wheel-drive. Back overseas, Chapman was still trying to get his money's worth. 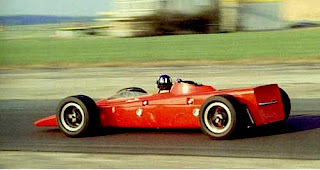 A modified version of the 56 (the 56B) was casually tried in Formula One during the 1971 season. The "B" would only compete in three F1 races where it proved heavy, unreliable, and overly complex. 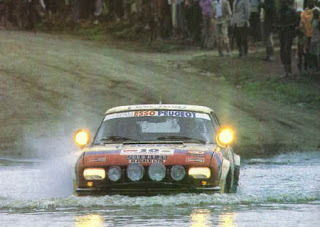 The car looked like a contender in the Dutch Grand Prix where wet-weather allowed the FWD system to come into its own, however driver Dave Walker went off-track and didn't finish. At Silverstone suspension failure put the car out, and finally Emerson Fittipaldi could only manage 8th at the Italian Grand Prix. The 56's career was finally over. Lotus had already carried-over the "wedge" design to the very successful 72 F1 car, but turbines whirred away into the history books. 1910 - 2010: Alfa Romeo's 100th birthday. For Alfisti all around the world the weekend of June 26th, 2010, was one to remember. In the United States the AROC National Convention drew crowds from all 50 states to the nation's capital to celebrate the automaker's 100th anniversary. Closer to Alfa's home but on the other side of the Atlantic Ocean another celebration took place for the same reason, this time in Milan. This event not only celebrated the 100 years of Alfa but also served as a launching platform for the newest member of the Alfa Romeo lineup, the Giulietta. If you've spent time around a pre-1972 Alfa Romeo you have noticed that the word "Milano" appears at the bottom of the logo. Alfa removed this when they opened another manufacturing plant in Naples and today Alfa no longer makes cars in Milan. This doesn't stop their heritage from living on in that city, however. One of the biggest pieces of Alfa Romeo's heritage is the Museo Storico, a large collection of production and prototype models ranging from Alfa's early days to more recent cars like the 164. To contradict the above the museum isn't actually in Milan but in a town called Arese - the location of the old Alfa Romeo plant - about ten kilometers north on the Autostrada, where the speed limit seems to serve more as an approximate suggestion than a strictly-enforced law. The visit to the museum wasn't a typical one: to promote the birthday celebrations Alfa exceptionally waived the entry fee and reserved part of their parking lot for visitors who drove up in their Alfas. The outside of the museum doesn't do much to incite one to enter; aside from a couple of signs after the freeway exit it's not particularly well indicated. Thanks to the people who drove there in an Alfa, on this special day the dull parking lot became as much of a museum as the Museo Storico itself and Alfas of all kinds, from pre-war cars to modern ones, basked in the Milanese sun while visitors admired them. The long wait to get into the museum proved well worth it and the photos will speak for themselves. Monaco's Monte Carlo Automobile brags that this Alfa V6-powered car runs on traditional gasoline, methane, bioethanol and liquid propane gas (LPG). That the car can also be powered by two Italians pushing it was not included in the press release. Outside the museum anybody with a valid drive's license could sign up to take the new Alfa Romeo Giulietta for a spin around Arese. The drive was not long enough to write a full report on it but the JTD model drives similar to a JTD-powered MiTo. Over twenty years after the Fiat takeover some purists will still gasp at the thought of an Alfa Romeo with an oil burner under the hood but the car was as lively as its gasoline-powered sibling. What's more, an engine without spark plugs powered an Alfa long before Fiat took the brand over; let us not forget that the Giulia Nuova Super was available with a 1760cc diesel in 1976; the Alfetta could belch out thick black smoke with either a 1995cc or a 2393cc, both with a turbo added to Rudolf Diesel's brainchild; and the flagship Alfa6 could be ordered with a turbodiesel as well, this time a 2494cc. Back in Milan Alfa displayed five new Giuliettas, each accompanied by a classic Alfa, in various spots of the city center. There, people passing could pretend they were in an Alfa dealership: brochures and salesmen were on hand and the Giulietta could be opened if one wished to sit in it. The next day marked the beginning of the centennial celebrations. More than 2,600 Alfas gathered at the Fieramilano business park (which is actually in Roh, right next to Arese) for a huge car show reserved for Alfa owners or Alfa-less folks who paid the extravagant entry fee. There again most every kind of Alfa produced was on hand; some of the rarer ones included several GTAs, a Giulia T.Z., and three Giulia Super Colli wagons. Those who didn't have something broken to mend spent the morning socializing with other Alfa owners while they waited for the buffet that opened at noon. After the show some of the cars parked around the Castello Sforzesco, an almost 600-year-old castle in the center of Milan, where the curious general public was invited to look at the cars. This display ended at approximately 10pm and the participants could either choose to go home after a long day or migrate to an participant-only (no cars involved) outdoors birthday party hosted by a local radio station. If one catches your eye and you want the high-resolution version of it feel free to contact us at ranwhenparked -at- hotmail -dot- com.